String of pearls, rather than branching. 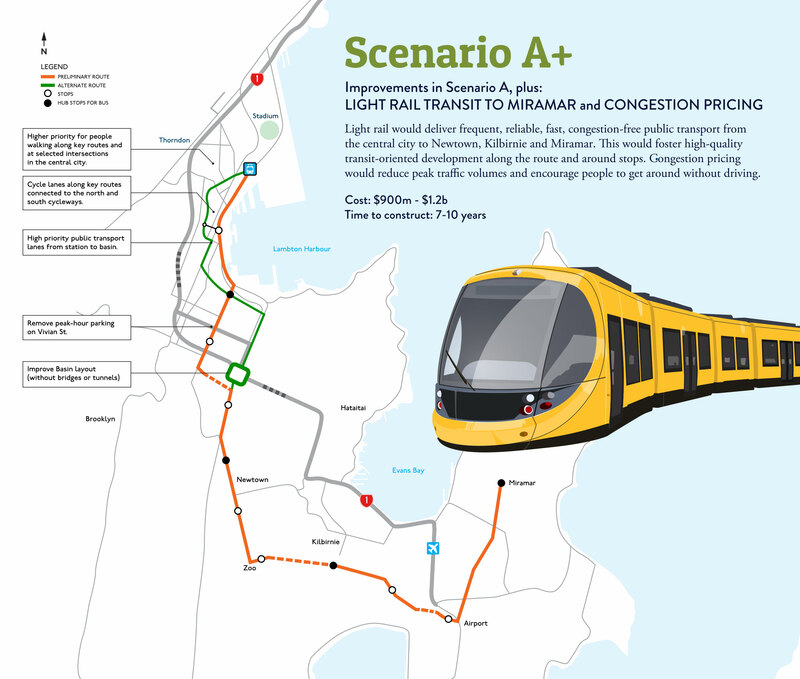 A string of pearls route offers the maximum number of one-seat light rail trips and many origin–destination choices. A branching route, on the other hand, means service operates at half the frequency on each branch, and people wishing to travel between branches have to change at Courtenay Place. A string of pearls route costs less to build and operate, while delivering a higher level of service. Waterfront, rather than Golden Mile. Taranaki Street, rather than the Terraces. A Golden Mile route continues on Courtenay Place to Kent and Cambridge Terraces, to the Basin Reserve. One possible option for separating light rail from east–west traffic is a short rail plus road flyover on Sussex Street. Runway tunnel, rather than Cobham Drive.